You won't forget the experience of spending time at this one of a kind hotel. There was nothing boring or ordinary at this "school" turned hotel. There's a playful mood the moment you check in and are handed your "Hall Pass" aka room key. The restaurant options were unique and delicious. Breakfast was wonderful. Break free from the mundane interstate hotels. Take the extra 5 minutes to drive another mile off the interstate and enjoy this extraordinary hotel. You won't be disappointed. My son and I stayed at the Hotel Grinnell last month and had a wonderful experience. Our room was lovely, the staff was friendly and helpful, and the building is very cool. We highly recommend this unique hotel!! This hotel has great accommodations - not typical of your normal hotel experience - much better! The rooms are all very neat, clean and comfortable and Hotel Grinnell is more of a comfortable home, rather than a stuffy hotel room. You can play bags, shuffle board, and really just hang out in the hotel atmosphere. We even grabbed some bikes that you can check out and had a great bike ride one afternoon. Outstanding hotel all around. From service to cleanliness, dining to decor (design perfection) this is definitely my favorite hotel east of the Rockies. I needed to stay an extra night unexpectedly due to weather and even tho they were almost fully booked for the evening I needed they were happily able to accommodate me with a different room and moved all my luggage- within an hour!- for me while I was attending events with my daughter- such a comfort on a day when changed plans could stress you out. Above and beyond sums this hotel up! The Hotel Grinnell is an incredibly unique property located right in the heart of Grinnell - an iconic small college town in Central Iowa. The repurposed Jr. High Building is chalked full of well thought out touches and amenities, as well as nods to its former educational use. The rooms are beautiful - everything has a story, from the locally forged steel furniture, to original wood floors, including the basketball floor in the event space. The 2 bunk rooms (x10 bunks) were a hoot as well, and are a genius concept for a town that sees traveling collegiate teams, etc. The 2nd floor auditorium is an incredible pairing for a property of this size and location. In terms of Grinnell - it is a small, college town - so week nights can be a bit sleepy, but the scenic downtown and local restaurants really are a great collection of midwest hospitality. This interesting hotel occupies a building literally joined at the hip with the Methodist Church, the other half of a city block that is itself only a couple of blocks from the main street. It used to be a high school, and then a middle school. Classrooms were divided and turned into intimate guest rooms with comfortable beds, iron-framed furniture, and school-themed amenities. We stayed in a King. It had a comfortable sofa, an easy-to-use desk (lab table height with a matching chair), and a shower equal to some we experienced in Europe. It's like taking a shower in a gentle rain. The sink was outside the bathroom, near the door. Across from it was a small blackboard, suitable for leaving messages for the staff. I had only two carps. One: It takes way too long to get hot water, a waste in a facility that otherwise takes care to reduce its footprint on the environment. Once it's there, it's plentiful and long-lasting. Two: Be sure to bring your own laundry bag, if you don't like to repack your used clothing. The hotel doesn't supply one. We took the clean liner out of a wastebasket to hold our soiled undies. One other thing: It's a bit pricey for what you get. This is why I gave it four stars instead of five. the "free" breakfast, for example, is all cold stuff, pastries and the like, including the coffee.. The restaurant is mostly a bar that serves appetizers. Go a couple of blocks to the Prairie Canary on Main Street. They're pricey, too, but at least you'll get full. Beautiful, classy, functional, quiet, high-ceiling, brightly-lit rooms and hallways. I wish I could be a kid again to explore the hotel or to go to school in the building. It was an old school. Can you imagine? Very comfortable bed and pillows. So clean. Spacious bathroom. Love the restaurant with tasty food. The AC was very strong and could conquer midwest humidity and heat. I've stayed at this hotel 5 or 6 times since it opened--I look for excuses to come to Grinnell so I can stay here. Lots to enjoy--a sophisticated experience that is comfortable and down to earth. Cool bar to meet friends or enjoy a drink on my own; the patio is wonderful (had a very memorable fall evening around the fire pit); staff is friendly and accommodating; and I love the rooms. Beds are AWESOMELY COMFORTABLE. Town is pretty and has some great food. I cannot wait to come back. Hotel Grinnell places you next to Central Park and within a 5-minute walk of Faulconer Gallery. This 3.5-star hotel has 45 guestrooms and offers conveniences like free breakfast, a 24-hour fitness center, and free in-room WiFi. Start your day off right with a free continental breakfast, served each morning from 7 AM to 10:30 AM. Savor a meal from the comfort of your room with room service, or entertain your taste buds with a beverage at the bar/lounge or coffee shop/café. A flat-screen TV comes with satellite channels and Netflix, and guests can stay connected with free WiFi and wired Internet. Pillowtop beds sport Egyptian cotton sheets and the bathroom offers a rainfall showerhead, a hair dryer, and free toiletries. Other standard amenities include a refrigerator, a minibar, and free newspapers. 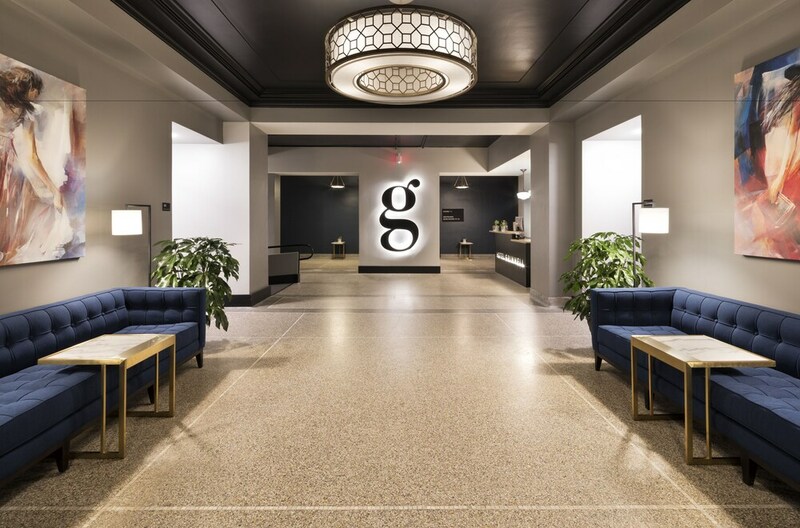 Renovated in 2017, Hotel Grinnell offers a 24-hour fitness center, free WiFi in public areas, and conference space. There's free offsite parking and an area shuttle. Multilingual staff at the 24-hour front desk can assist with tours or tickets, luggage storage, and dry cleaning/laundry. Other amenities at this golf hotel include a 24-hour business center, coffee/tea in a common area, and free use of bicycles. Free continental breakfast is served daily from 7 AM to 10:30 AM. Recreation features at Hotel Grinnell include a 24-hour fitness center and complimentary bicycles. The preferred airport is Des Moines, IA (DSM-Des Moines Intl. ): 64-min drive, 59.6 mi/96 km. The front desk is open 24 hours a day, and checking out is easy with express services. Driving? This property offers free nearby parking.